Back Bay Books, 9780316122689, 448pp. A pulse-pounding thriller about a small town, a dead girl, and an investigator with nothing to lose. Mark Novak just wants to come home. Still mourning the death of his wife, private investigator Mark Novak accepts a case that may be his undoing. On the same day his wife died, the body of a teenage girl was pulled from the extensive and perilous cave system beneath Southern Indiana. Now the man who rescued the girl, who was believed to be her killer, begs Novak to uncover what really happened. Garrison is much like any place in America, proud and fortified against outsiders. For Mark to delve beneath the town's surface, he must match wits with the man who knows the caverns better than anyone. A man who seems to have lost his mind. A man who seems to know Mark Novak all too well. 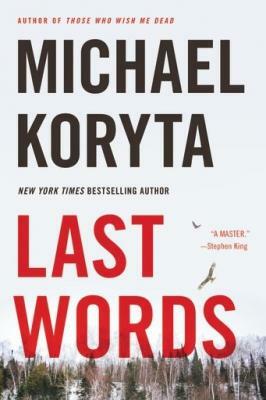 LAST WORDS is a pulse-pounding thriller of one man's undoing; you just may not know which man. Michael Koryta is the New York Times bestselling author of ten novels, most recently Those Who Wish Me Dead. His previous novels--including The Prophet, The Ridge, and So Cold The River--were New York Times notable books, national bestsellers, and have been nominated for numerous awards, including having won the Los Angeles Times Book Prize. A former private investigator and newspaper reporter, Koryta graduated from Indiana University with a degree in criminal justice. He lives in St. Petersburg, Florida, and Bloomington, Indiana.